New teacher Lauren Marcotte changes the chemistry of TJ’s science department. Lauren Marcotte is the newest edition to the science department as a Chemistry and Earth Science teacher. This is Marcotte’s first year teaching; she joined the TJ family after she decided she wanted to inspire students with science. Marcotte was born and raised in the university town of Urbana, Illinois, and received her Bachelor of Science degree in Chemical Engineering from the University of Kansas and minored in Geology; she followed this up by earning her teaching degree from Metropolitan State University of Denver. After graduating from KU, she decided to go into the oil industry. “My college experience was in geology and chemical engineering. The oilfield was a nice overlap of those two interests,” explained Marcotte. She worked as a fluids engineer in a few different oil fields in Wyoming and northern Colorado. As a fluids engineer, Marcotte worked on a drilling rig for two weeks at a time. She ran chemical and physical tests two to three times a day and adjusted the treatments of mud (liquid that lubricates, provides rotation, and provides back pressure down the oil hole). “I absolutely love chemistry and the engineering aspect gave me a way to use science to solve problems,” stated Marcotte. When not in school, she likes to ride her bike around town and go on walks with her husband and two dogs. Marcotte originally moved in early 2013 to be able to enjoy the outdoors and all that Colorado has to offer. Marcotte is very excited to be a teacher helping students, “I get to interact with and inspire students who are curious about the world around them,” said Marcotte. She hopes as a teacher to inspire students to pursue a career in science as she did. She is very much devoted to her students and wants them to succeed. “She is super dedicated to her students and is always willing to help,” said sophomore Max Herbst. 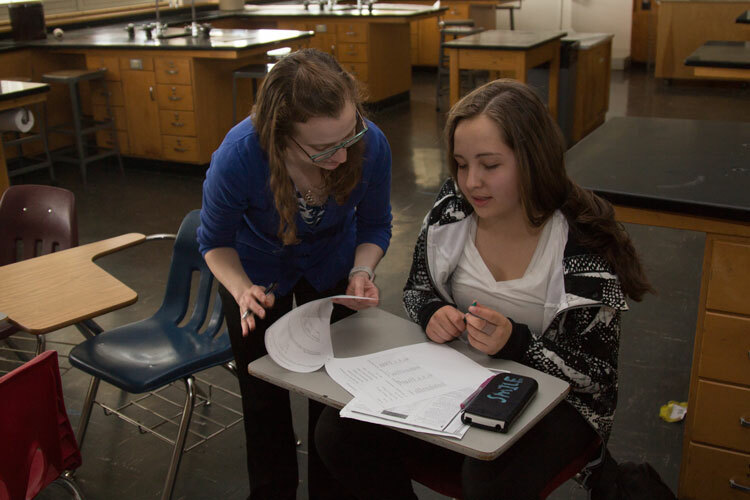 In her Honors Chemistry class, students learn about basic chemistry and facts through laboratory experiments, book work, lectures, and demonstrations. “Her class is very interactive and fun. Every day is full of new possibilities and allows us to excel,” said junior Ariel Shunneson. For her Earth Science class, students learn about topics such as scientific inquiry, geology, Earth’s geosphere, natural resources, astronomy, and Earth’s fluid sphere. Marcotte is a hard worker who is dedicated to her students; she has been nothing but helpful to TJ since joining the team earlier in the year. Her commitment to teaching shines in the classroom with her students. Marcotte is happy with a successful first school year and is looking forward to the next.